Avoiding soft cheeses, deli meats and dressings like mayonnaise is well known to pregnant women to avoid contracting the bacterium, Listeria monocytogenes. But rockmelons are less well known for causing listeriosis outbreaks. One of the largest outbreaks due to Listeria monocytogenes on rockmelons was in the US in 2011, where 33 people died. In Australia between January and April 2018, there were 22 human cases of listeriosis associated with consumption of rockmelons linked to a single NSW farm. The cases of listeriosis occurred across New South Wales, Victoria, Queensland and Tasmania and led to seven deaths and a miscarriage. The NSW Food Authority report on the investigation into the outbreak concluded that adverse weather events were the major contributors to the outbreak, with heavy rains in December and subsequent dust storms significantly increasing the organic load and amount of Listeria on the fruit. Some other factors were also noted as potentially contributing to a lesser extent. The incidence of listeriosis (the bacterial infection caused by eating food contaminated by Listeria) is comparable in Australia to other western countries – we have around 60-70 cases per year. We had an outbreak linked to cheese in late 2012-early 2013 and that was our last large-scale Listeria incident. Listeria, along with Salmonella, is responsible for more deaths in Australia than any other foodborne disease, each accounting for about 15 deaths per year. Listeria is generally only contracted by a fairly small, vulnerable group of people – the elderly, unwell and pregnant women – but it is fatal for about 1 in 5 of those who contract it. Compared to other pathogens (microorganisms that make humans sick or is fatal) like Salmonella or E coli, Listeria has a high mortality rate among the risk groups. The three people who have unfortunately passed away this week from infected rockmelons were over 65. Listeria is abundant in the environment and therefore it’s difficult for food producers and processors to control it. It’s commonly found in the soil which, of course, is where horticultural crops like rockmelons happen to grow. 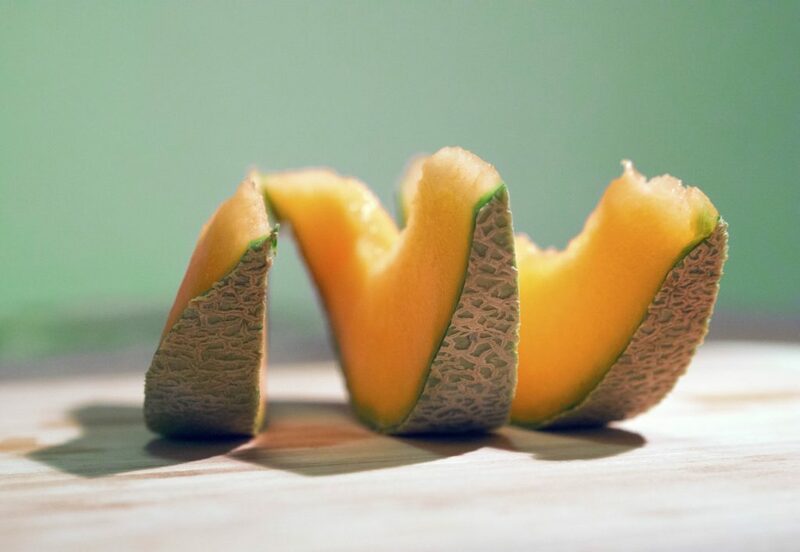 Additionally, the ‘netted’ nature of the rockmelon skin makes it particularly hard to clean and sanitise. Listeria can go from the soil to the melon skin and although it doesn’t grow on the skin, when we slice the melon to eat it that can introduce it into the flesh. Then, we mightn’t eat it all at once but a few days later cut it up some more and put it out to eat at a picnic, and the bacteria has grown even more. Or if you leave it out of the fridge, it can grow faster. Listeria grows at four degrees but keeping it in the fridge will help slow the growth. Because rockmelon is less acidic than say tomatoes, there’s more chance of microbes surviving. So, should we wash rockmelons at home before eating them? It shouldn’t be necessary because they’ve already undergone a cleaning process. Australia’s food safety procedures are among the best in the world but there’s no harm in giving them a scrub, especially if obvious dirt can be seen on the fruit. Rest assured, the rockmelon industry has taken significant steps to even further strengthen their food safety procedures since the incident including one-on-one food safety consultations with all Australian rockmelon growers and packing sheds and developing a best practice toolbox. What can we do at home to reduce our risk of food-borne illness? Key food safety tips include washing your hands, storing food that is meant to be chilled (like salad bags) at 5 degrees or colder, cooking food properly and keeping raw and cooked foods separate during storage and preparation. An additional outcome of the 2018 outbreak is that health authorities are now recommending that vulnerable persons do not consume rockmelons, along with other higher risk foods, to minimise their risk of exposure to Listeria (see more in the NSW Health Listeriosis fact sheet). This article was first published 2 March 2018 and updated 5 December 2018. I had Hepatitis A as a kid, as a result of fruit fertilised by human faeces. So am particularly interested in the cause of soil borne diseases. Listeria seems relatively new – the first outbreak recorded in Canada due to sheep manure in 1981 (see Wiki). I also believe prevention is much better and cheaper than cure, hence am building a community focused website called FindGoodFood, so consumers can find out exactly where their food is coming from, how it has been farmed, what is in it, etc. I don’t think the picture is clear in this case. Why rock melons and not water melons and other vegetables food sources .that do not involve cooking There may be other issues here .I concur with the other storage type issues. Because of the rough texture of rock melon skin, washing the skin of melons won’t really remove a lot of pathogens without using a sanitiser as well. Most healthy people won’t be affected by consuming a few pathogens. I agree that washing is at home is not necessary. I think your advice that washing rockmelons purchased from the supermarket is “not necessary because they’ve already undergone a cleaning process” is misleading and potentially harmful. The ABC reported last Thursday that the rockmelons involved in the current listeria outbreak were traced to a particular farm and that “The contamination is on the fruit’s skin, not in the flesh.” So what went wrong? Was it a problem with the cleaning process? Would washing the fruit after purchase have helped prevent illness and death? Surely it makes sense to wash all fruit and vegetables before eating them or cutting them up, especially if you intend to serve or store the cut fruit with the skin still attached and in contact with the flesh of other pieces of fruit. Furthermore, washing will remove dirt or pathogens that fruit and vegetables may come into contact with after the growers’ or sellers’ cleaning processes, for example through being handled by customers in the shop, coming into contact with raw chicken in a trolley or shopping bag, rolling around in the boot of a car, being sneezed on by a toddler, and so on. “Thanks for your feedback Beryl. Our recommendation that it is not necessary for additional washing of melons at home aligns with that of others. Previous scientific studies have suggested that bacterial pathogens including Listeria, E. coli and Salmonella are rarely found on the surface of rockmelons. We’re consuming microbes on our food every day and in the majority of cases, healthy people should not be affected by consumption of a few cells of a bacterial pathogen in foods. However, if anyone feels that food may potentially have been contaminated during shopping and/or handling such as from raw chicken as you mention, then of course it should be washed. Also if fruits and vegetables have obvious dirt on them then it is advisable to wash them under your cold water tap. If there is any obvious damage to the surface of the melon don’t consume it. When storing food in the fridge it is important to ensure that ready to eat foods such as salad vegetables and fruits are kept separate from raw meat and that raw meat is contained so juices cannot drip onto ready to eat foods. The NSW Food Authority has additional information about minimising risks with produce consumption, melons in particular, and this includes things like refrigerating fresh produce within 2 hours of peeling or cutting or discarding it if left at room temperature for more than 2 hours: http://www.foodauthority.nsw.gov.au/foodsafetyandyou/special-care-foods/rockmelons. Thank you. This is useful information. When you mention “unwell” perhaps you could also specify people whose immunity is lower than usual, e.g. because of chemotherapy? Please? People nowadays know to take care when offering food to pregnant women, but there seems to be widespread ignorance of the consequences for some cancer patients from this and other bacteria-borne illnesses. Well, from any contagious disease really. The vulnerable, at-risk groups or unwell people that we refer to include pregnant women, the elderly (people generally over 65-70 years of age), children under 5 years and people with weakened immune systems due to medical treatment e.g. chemotherapy, disease or illness, such as cancer, leukaemia, AIDS, diabetes, liver or kidney disease.